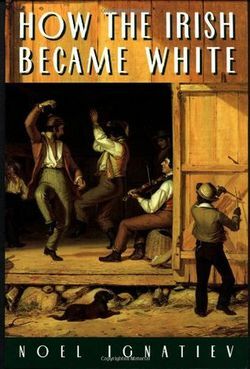 Noel Ignatiev's book How the Irish Became White explores the emergence and development of racial ideology in nineteenth-century America. the Irish make for a particularly interesting case study. The droves of Irish Catholics immigrants departing a homeland in which they were a subject race ruled over by the English and Irish Protestants were by no means welcomed with open arms in the United States. Many Americans viewed them as little different from African slaves. Terms like “white negroes” and “smoked Irish” highlighted the lack of significance an Irish Catholic’s skin color held to many native-born Americans. Largely poor and unskilled laborers, Irish Catholics were forced to take only the most menial of jobs. Given the common experiences of ethnic and economic oppression shared by both Irish Catholics and black slaves, abolitionists of the period thought the Irish would be natural allies in the battle to end chattel slavery in America. Instead, the exact opposite proved true. In How the Irish Became White, Noel Ignatiev argues that in the United States, Irish Catholics found an opportunity to shed their status as an oppressed race in their native land and join the oppressor class in their new home. As he puts it, “In becoming white, the Irish ceased to be green,” (3). Ignatiev begins his investigation with a look at the response to Daniel O’Connell’s appeal to Irish immigrants in America to join the cause of abolitionism in 1841. O’Connell was a critical Irish political leader and member of the British House of Commons who held influence over Irish everywhere. In Ireland, he championed a campaign to remove a moratorium on Catholics being allowed to serve in government. He campaigned for a repeal of the Act of Union and the restoration of an Irish parliament. He was also a staunch abolitionist. Naturally, American abolitionists thought an appeal from him to his countrymen in the United States would go a long way towards convincing them to join the abolitionist cause. But O’Connell’s appeal had the exact opposite effect. Citing numerous editorials from Irish newspapers and personal correspondence from men on both sides of the argument, Ignatiev uses the Irish response to O’Connell’s appeal to frame his study. One sentiment was resentment at Irish Americans being addressed as a separate class in America, coupled with an insistence that Irish Americans are, in fact, Americans. Irish American newspapers painted O'Connell as a foreigner attempting to meddle in America’s domestic affairs. Despite their insistence that they were entirely American citizens, nativist political forces still saw the Irish presence in America as a problem. Capitalizing on the situation, the Democrat Party was able to trade protection against nativist politicians in exchange for Irish support on the issue of slavery. Ignatiev then examines the experience of the Irish Catholics in Ireland and their early reactions to race patterns in the United States. He notes that in systems of national oppression, “… the conquering power implements its dominance by incorporating sections of the elite classes of the subject population… into the ruling apparatus. Under the system of racial oppression, elite rule rests on the laboring classes of the oppressor group,” (42). The Irish immigrants had known both in Ireland. Before the Act of Union in 1800, the British ruled Ireland under a system of racial oppression in which the Catholics were the subjugated group. But with the Act of Union came the end of the Protestant Ascendancy for the Catholic bourgeoisie to be incorporated into the ruling class. “The absence of fixed, institutional distinctions between black and white led prisoners of European descent, particularly the Irish who are the subjects of this study, to view themselves, and act, more as people trying to get out of jail than as white,” (60). Ignatiev then ends the chapter with a brief discussion of Thomas Branagan, a man he claims, “… personifies some of the ambiguities of the Irish stance towards Afro-Americans in the early period. Born in Dublin in 1774, Branagan’s experiences as a sailor in Africa and Antigua inspired him to write numerous works denouncing slavery and extolling the beauty and virtue of Africans. But in 1805 after having lived in Philadelphia for six years, his attitude quite radically changed when he published a new work that claimed the most significant problem slavery created was “free negroes.” Ignatiev argues that events like Toussaint L’Ouverture’s campaign to exterminate whites in Haiti had led men like Branagan to begin to see themselves as potential victims of the slaves’ struggle for freedom. Next, Ignatiev examines the role of the Democrat Party of Andrew Jackson. He argues, “White supremacy was not a flaw in American democracy but part of its definition and the development of democracy in the Jacksonian period cannot be understood without reference to white supremacy,” (79). Returning earlier to the notion that the Democrats traded protection from nativists to the Irish in exchange for support for their peculiar institution, Ignatiev argues that rather than the existence of slavery giving the Irish something to stand on as they climbed into the ranks of the oppressor race, it was instead the inclusion of the Irish into the oppressor race that made the continued existence of slavery possible. Utilizing early nineteenth-century Philadelphia alderman John Binns as an example, Ignatiev shows how many Irish had adopted worldviews that were essentially Jacksonian. But the messiness of Binns’ political career shows the Irish affinity for the Democratic Party during this period was not as simple as jumping on the bandwagon. According to Ignatiev, the Democratic Party chose to reject nativism and deflected criticisms of slavery by pointing out the plight of the white worker in order to ease the assimilation of the Irish into the oppressor race and thus support the institution of slavery. In his discussion on Irish labor, Ignatiev notes that “white” for newly arrived immigrants was only one identifier among many. To truly become “white,” Ignatiev argues that the Irish first, “… had to learn to subjugate county, religious, or national animosities… to a new solidarity based on color,” (111). Because slaveholders had an interest in ensuring the degradation of free blacks and escaped slaves in the North, they allied with Northern labor. Echoing scholars like David Roediger, Ignatiev notes the “bi-polar system of color caste” allowed that all whites, no matter how low in status, could still enjoy status over the highest non-whites. Drawing on Machiavelli’s notion of the “Tumultuous Republic,” Ignatiev examines the role of rioting in Jacksonian America, in particular, the “Flying Horses Riot” in Philadelphia in 1834. A well-organized mob attacked places of race-mixing and the homes of black Philadelphians. In neighborhoods where recently arrived immigrants and blacks both lived, the homes of whites with candles placed in their windows were spared. Ignatiev argues that this type of disorder is a form of order and serves as a type of supplement to the laws of the land rather than representing an opposition to those laws. Moreover, the ability of organized rioters to both strike down overt opposition and force anyone else into silence no longer merely reflected public opinion but directly shaped it. In comparing earlier nativist and anti-Catholic riots targeting Irish immigrants to race riots targeting blacks, Ignatiev notes a key difference to emerge is the Irish being “allowed” to defend themselves. Blacks attempting to defend themselves against violence in this period of history often provoked an even greater backlash. White people, by contrast, did have the right to defend themselves. By successfully defending themselves against nativist mobs, the Irish laid claim to a right denied to blacks, thus furthering their transition to members of the white race. The first consolidated police force, created to help deal with incidents like the Flying Horse Riot, was initially composed of nativists. But through their alliance with Democrats and powerful Irish gangs, this force quickly gave way to the emergence of the Irish cop. This was a profoundly significant change, as Ignatiev argues, “It meant the Irish were officially able to defend themselves from the Nativist mobs, and at the same time carry out their own violent agenda against black people. The Protestant Ascendancy had given way to the White Republic," (189). Ignatiev’s probing look into the Irish finding their place offers a new view on the emergence of racial ideology in America. It sheds light on glaring holes left by New Labor historians like Herbert Gutman who, Ignatiev says in the Afterward of How the Irish Became White, ignore troubled race relations to discover a “usable history” to guide new labor movements. In particular, Ignatiev criticizes their failure to explore the relationship of “whiteness” to labor. How the Irish Became White is much more in line with works like The Rise and Fall of the White Republic and Wages of Whiteness. But where Ignatiev diverges from Saxton and Roediger is the degree to which he gives the Irish agency. “The outcome was not the inevitable consequence of blind historical forces, still less of biology, but the result of choices made, by the Irish and others, from among alternatives. To enter the white race was a strategy to secure an advantage in a competitive society… In viewing entry into the white race as something the Irish did “on” (though not by) themselves, this book seeks to make them the actors in their history,” (3,4). On that point, How the Irish Became White most certainly succeeds in doing so.